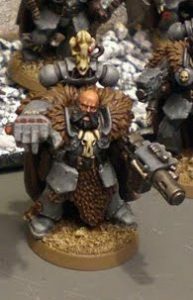 Adam from the now defunct Space Wolves blog featured Combi Melta Conversion Guide. 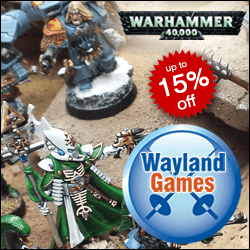 The Space Wolves Blog is unfortunately no longer with us so in an effort to save this important resource we have rescued as many articles as we could and republished them here. 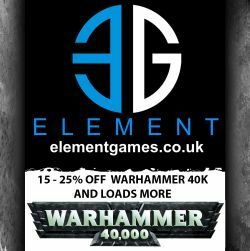 You need a storm bolter arm, a plastic melta gun (good luck if you’re using the metal ones!) and a bolt pistol. You’ll notice I’ve used a Black Templars melta gun. This is because they’re cheaper and more readily available than other plastic melta guns online. Plus, we’re not using any of the bits with Black Templar details, so we’re really on to a winner. Before you begin, make sure all of these are cleaned up and free of flash or mould lines. Take the storm bolter and using a Stanley knife, carefully cut the detail off the side. I tend to scrape the back of the blade across the flat surface to ensure a good, smooth, flat surface. But you should use a modelling file really. Once you’ve cut them off, use a file (or the knife scraping technique) to get a flat, smooth surface. Now for the fiddly part! Pick up the melta gun, take your stanley knife and gently press/wiggle it just underneath the fuel tank on the side of the gun until you’re just under half way through. You’ll want to remove the whole side of the fuel tank and the two wires that come out underneath it. Once just under half way through, turn it over and come at it from the other side. It will bend slightly once you’ve cut it free, but it should still fit to the smooth side of the storm bolter fine. If not, trim it flat at the back with your knife. Next, you need to cut the barrel free from what’s left of the melta gun. Nice and simple. Just line the knife up to the edge where the stock meets the barrel and cut straight through. Give the back of the melta gun barrel a very careful trim to get a flat-ish surface. You’ll be surprised how well it glues on to the front of the storm bolter in a second. Just like with the melta gun, but a bit smaller. Line the knife up to the edge where the stock meets the barrel and cut straight through. You should get the little sight just above the barrel with it and probably a little bit of flash around where you cut. 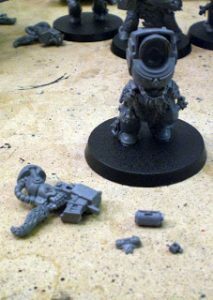 Don’t worry, that will help it glue to the front of the storm bolter much easier. Polestyrene cement will melt the thin plastic and cover any little bits like that. In this game, it’s ‘glue once’. Hold the melta gun barrel to the front of the storm bolter. Is it nice and straight? If not, turn it round and see if it’s straight with attached upside down. More often than not it fits quite well. The same goes for the bolt pistol barrel and sight. Both might need a tiny (tiny) bit of trimming get a reasonable fit. Use polystyrene cement to glue them on and this amazing plastic melting glue should do the rest. Although it doesn’t hurt to adjust the barrels from every angle once glued on to make sure they’re straight. I also recommend gluing the bolt pistol barrel on first, because once the melta gun barrel is glued on, it’s hard to get at with your fingers. Put it down and leave to dry. Once dry, glue the melta gun fuel tank on to the flat, smooth side of the storm bolter. When it comes to building combi meltas, I would always recommend using storm bolters as the basis. They’re big, but they’re fairly squat guns, which makes them look good in the hands of even power armoured troops, like this Wolf Guard on the left. 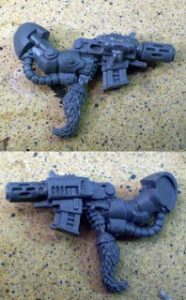 Notice that I’ve used the power armoured storm bolter from the Space Wolves sprue in this example. I found that the regular combi melta that’s built on top of a regular bolter just looks too long and skinny some how. But with a bit of extra bulk the storm bolter seems more visually acceptable.